Gran's short term memory is fading and she becomes separated from her family on a shopping trip. There is nothing short term however about Gran's love of books and her strong bonding with her grandchildren. 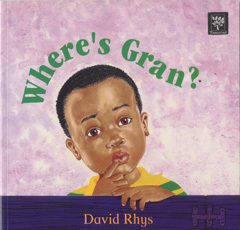 A great story to read to children who are part of a mixed-race family Where's Gran will help them see there are other families like theirs. It also introduces them to older relatives who may also be a little absent minded, losing and finding something they care for, remembering things and explaining to others.